Gosh, you must be sick, sick, sick of hearing about this everlasting road trip from Huntington Beach, CA to Philadelphia, PA. Well, if not, thank you for still reading! It took 5 days to get from Surf City to Steel City. We arrived at the Inn at the Mexican War Streets, a gothic mansion purchased in the early 80s by the existing owners for $100k, who, later got it appraised to have $100k worth of blood marble in around the fireplace alone. Nonetheless, it's an incredibly luxurious bed and breakfast for a fantastic price and an opportunity to be part of Pittsburgh's rich history. The mister and I urban hiked to Penn Brewery, and while I don't have much to say about their beers besides being reminiscent of Budweiser, I do have to say their pretzels were delicious. Chewy and soft inside, the outside provided a pleasantly lye ridden crust. The Original Penn Beer Cheese - basically sharp cheddar blended with cream cheese and Penn pilsner - has become a memorable favorite cheese with the husband. I thought it had a nice bite, but nothing too crazy special. 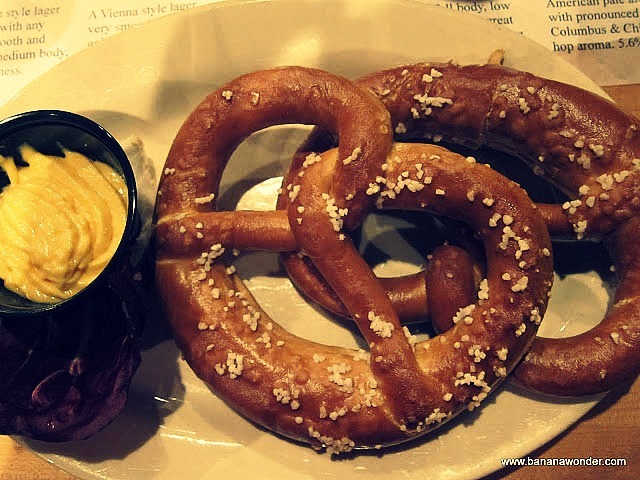 For $4.95 for two large pretzels and a good dose to beer cheese, Penn Brewery gets thumbs up for their knot, not for their beer. I for one am loving this road trip! It is making me want to go back to America to discover more of the country! Anna - You should come back for the big one! Looks like a wonderful trip. I can't wait until I get to visit too.